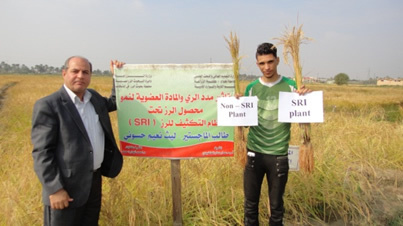 After learning of SRI at an international forum on hybrid rice in China in 2004, Dr. Khidir A. Hameed, a rice scientist from the Al-Mishkab Rice Research Station (MRRS) near Najaf, was the first to try out SRI methods in Iraq. In 2005, on ¼ hectare with the "parachute method," he tried early transplanting (12-day-old seedlings) and wide spacing (25x25 cm), using just 30 kg of seeds per hectare. With the popular variety Amber 33, SRI yields were 18% higher than with the usual dry method and resulted in 81% seed saving plus unmeasured water saving. Trials carried out in three provinces (Basrah, Messan and Thi-Qar) were impressive enough that the Minister of Agriculture, when visiting them, promised to support extension of the new methods. 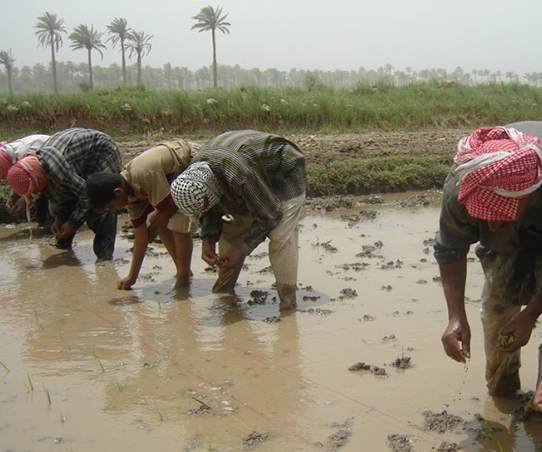 Labor: Because labor scarcity has made transplanting rice difficult in Iraq, a "parachute planting" method was devised, which involves throwing young seedlings onto a shallow-puddled field, where they establish themselves without being pushed into the soil. During subsequent years, a paddy mechanization project carried out cooperatively by MRRS with the State Board of Agriculture Extension and Cooperation (SBAEC) and the State Bureau of Agricultural Research (SBAR) has shown greater promise for dealing with labor constraints (see video and photos of the mechanized transplanter). Water: Water saving is of much interest in the Iraqi context. Trials in 2006 showed yield increases of 20-26% with a reduction in water requirements. A field study on water use efficiency (IWUE) conducted in 2009 at MRRS evaluated irrigation with traditional methods compared to SRI recommendations. SRI methods resulted in more vigorous growth of roots, a 42% increase in grain yield, and WUE of 0.291 kg/m2 compared with 0.108 kg/m2 for conventional rice crop and water management, almost a three-fold difference. SRI reduced the need for irrigation water by about 38.5%. Organic matter: According to a report, SRI has led MRRS researchers to pay more attention to use of organic matter, instead of relying entirely on chemical fertilizer, with promising results. In 2009 trials, the SRI treatment using 5 tons/ha of OM combined with half the usual amount of chemical fertilizer gave the highest average grain yield (7,360 ton/ha), 22% more than the lowest treatment (6,036 ton/ha), which was achieved with farmers’ current transplanting methods. In order to increase the availability of organic matter, more than 100 farmers in three provinces (Najaf, Diwaniya, and Al-Muthanna) have cultivated a clover crop after their rice crop to restore the fertility of their rice-growing lands, although the areas used are still small since the government has not received or provided sufficient clover seeds. During 2007, a national SRI committee was established with several staff of Al-Mishkab Rice Research Station (MRRS) near Najaf, including its Director and a representative from the General Company for Horticulture and Forestry, which has experience with the production and management of organic matter. The committee intended to promote extension of SRI methods in Iraq and to formulate a national SRI project. The expansion of SRI work in Iraq during 2008 was assisted by a Japanese donor who learned about the initiatives of Dr. Khidhir and colleagues through this SRI website. Summer season experiments with Jasmine rice in Al-Muthanna Province in southern Iraq confirmed that SRI practices can, despite greatly reduced plant populations, improve both plant performance and yields under Iraqi conditions (7,040 kg/ha compared with 4,668 kg/ha for non-SRI methods) while reducing water use, saving seed (as much as 80%), and lowering costs of production. SRI - System of Rice Intensification in Iraq. 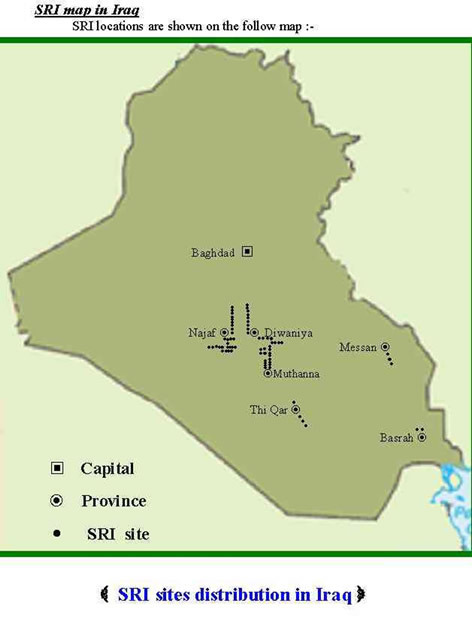 A video produced by MRRS in 2009 documents SRI success and constraints in Iraq based on 2008 experiences promoting SRI in Al-Muthanna Province. For implementation of SRI over large farm areas, the authors (Hameed et al.) recommend use of a transplanting machine, which is being tested at the Al-Mishkhab Rice Research Station, Najaf. Dr. Abdul Hussein El-Hakim had done an assessment of the economic costs and returns for the 16 farmers in four districts of Al-Muthanna province who used both SRI and conventional methods on their farms in 2008, as well as for 16 nearby farmers who grew rice with their usual methods. The farmer evaluations of SRI were uniformly positive, citing 25-30% less irrigation water required, 50% reduction in fertilizer and 75-80% reduction in seed requirements; this was accompanied by a 100% reduction in agrochemical crop protection. Average yields were 75% higher with SRI methods. These benefits are starting to attract support from the Ministry of Agriculture and donor agencies, according to Dr. Khidhir, who was given an award in recognition of his work on SRI and water management by the Prime Minister during the country's Second Agricultural Week held at the Baghdad International Fairgrounds, April 14-21, 2010. With support from the Iraq Ministry of Agriculture, the State Bureau of Agricultural Research (SBAR) and Al-Mishkhab Rice Research Station (MRRS) continued their SRI activities in 2010, primarily working in Najaf and Diwaniya Provinces with cooperation from the State Board of Agriculture Extension and Cooperation (SBAEC) and the Directorates of Agriculture (DAs) in those provinces. During 2011, an article documenting positive SRI results for irrigation was published in the Journal of Paddy and Water Environment. Later that year, a workshop at the Ministry of Agriculture revealed growing interest in extending SRI to to other provinces, with most supporting the use of transplanting machines in their areas due to labor considerations. The Minister of Agriculture also agreed to establish an SRI ministerial committee for planning and managing the SRI system in Iraq. Khidhir Hameed from the Agricultural Research Office Al-Mishkhab Rice Research station summed up the past nine years of SRI progress in Iraq in his presentation on Iraq's Strategy for Innovative Rice Irrigation and Water Management in Iraq at the Drought Risk Management, Desertification and Dust Storms Workshop held March 2-6, 2014, in Amman, Jordan. In 2016, Laith Naeem Hassouni from the College of Agriculture in Baghdad University completed his master's thesis on the effects of irrigation scheduling and the application of organic matter on rice yield under SRI. The thesis showed great benefits from water reduction contributing to a yield increase of 29.5%. During October 2018, Khidhir Abbas Hameed represented Iraq at two SRI events in Southeast Asia: 1) Workshop to Enhance Cooperation and Sharing among SRI National Networks in Asia and 2) the SRI research side event at the 5th International Rice Congress (IRC) in Singapore. (His presentations at the events are listed below). 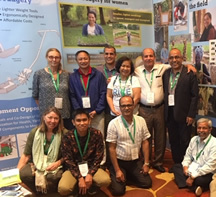 Prior to the participating in the SRI Networks Workshop in Malaysia, Hameed attended the 5th International Rice Congress (IRC) in Singapore, held October 15-17, 2018. During the Congress, he presented a poster during regular sessions as well as a talk on Rice Water Management and Reduction in Iraq at the SRI-Rice research side event (SRI Research: What's New and What's on the Horizon, held October 16; see other side event presentations. )Hameed also helped provide SRI information to the event participants from the SRI-Rice/Oxfam booth during the three-day event. He is shown (standing second from right in the picture at left) together with SRI colleagues at the SRI booth. [October 15, 2017] In 2016, Laith Naeem Hassouni from the College of Agriculture in Baghdad University conducted trials on the System of Rice Intensification (SRI) in Al-Mishkhab Rice Research Station, Najaf, for his master’s degree. The title of his research project was "Effects of irrigation scheduling and the application of organic matter on rice yield under the System of Rice Intensification (SRI)." The implementation of the trials was supervised by Khidir Abbas Hameed. Hassouni defended his thesis effectively, obtaining a high privilege degree, the highest honor received by a master's student so far in the Department of Soil and Water Resources at the college. Hassouni subsequently published an article on portions of his work in the Iraqi Journal of Agricultural Science. The trials evaluated three different irrigation regimes (continuous submergence, and intermittent irrigation at 3-day intervals and at 5-day intervals) with three amounts of organic manure (0 ton/ha, 5 tons/ha, and 10 tons/ha) for growing two important rice varieties (Anber33 and Jasmine), comparing these treatments’ results with the results of conventional methods of rice cultivation. The thesis showed great benefits from water reduction contributing to a yield increase of 29.5%. The water reduction compared with continuous submergence was 57.6% when irrigation intervals were 3 days and 63.2% when they were 5 days. The amount of water consumed with 3-day intervals was 3.67 mm (equal to 36,762 m³.haˉ¹) and with 5-day intervals, it was 3.18 mm (equal to 31,869 m³.haˉ¹). With continuous submergence, water consumption was 8.66 mm (equal to 86,678 m³.haˉ¹). Also, with the intermittent irrigation and SRI crop management (transplanting of young, single seedlings, widely spaced in a square pattern), there were improved soil physical properties, more vigorous root systems, and better plant performance, all with consumption of less water. [February, 2016] Because of positive results with the SRI system, Iraq's Ministry of Agriculture and Ministry of High Education and Scientific Research have planned to do studies on the SRI system and put it into their approaches to developing the rice sector in Iraq. In the 2015 rice season, Laith Naeem Hassoni (right) began conducting trials on SRI at Al-Mishkhab Rice Research Station for his Master's thesis on the influence of irrigation periods and organic manure on rice growth under System of Rice Intensification (SRI). During the rice-growing cycle, the amount of irrigation water was measured for several irrigation levels (continuous flooding, 3-day intervals, and 5-day intervals), with decomposed organic manure applied to SRI plots at two levels (10 tons/ha, and 5 tons/ha). The results of the SRI plots were were compared with non-SRI management (farmer practices). [March 2014] At the invitation of the UNESCO-Iraq Office at Amman, Khidhir Abbas Hameed from the Agricultural Research Office Al-Mishkhab Rice Research station in Iraq made a presentation on Iraq's Strategy for Innovative Rice Irrigation and Water Management in Iraq at theDrought Risk Management, Desertification and Dust Storms Workshop (right) held March 2-6, 2014, in Amman, Jordan. The event, which was one of three workshops to create a database of indicators to formulate policies and strategies on Iraq's increasing water scarcity, was sponsored by the United Nations Education, Scientific and Cultural Organization (UNESCO) with the support of UNDP, UNEP, and FAO. This final validation workshop was held to discuss key outputs with government delegations from line ministries, and endorse the recommended actions to appropriately meet drought risk related challenges in Iraq. Research was carried out by Al-Mishkhab Rice Research Station (MRRS) in Al-Muthanna Governorate to identify farmers attitudes towards SRI and to elucidate the relationships between farmers' attitudes and several personal and social factors. The population studied consisted of all the rice farmers in Al-Muthanna Governorate who had been covered by activities, training, and application of SRI -- approximately 2,400 farmers in Rumatha, Warkaa, Majd, and Najmi locations. A random proportionate sample (5%) was selected, bringing the sample size to 120 farmers who answered the questionnaire. The results showed that 65% of respondents had a favorable attitude towards using all the SRI practices, 22% of respondents had not formed an opinion, and 13% of respondents had an unfavorable attitude. Attitudes toward the individual practices were all higher on average than using all the practices together, with individual practices consisting of transplanting of single seedlings, wide spacing of transplanting, early transplanting, organic fertilizer production and use, green manure, application of intermittent irrigation, hand and mechanical weeding. Results showed significant differences in respondents' attitudes according to certain variables: Education level, size of holding, type of holding, and number of years of rice-growing experience. No significant differences in respondents' attitudes were found according to these variables: age, size of family, participation in agricultural extension activities, and agricultural information sources. See full report for details. Recommendations based on the findings of the study are to a) scale up by using transplanting machines (and make them available) and introduce simple rotary weeders to reduce herbicides, thereby reducing soil and water pollution as well, b) establish a special symposium, extension program, and training course about SRI in order to change unfavorable attitudes and solidify undecided attitudes, taking farmers' suggestions into account, and emphasizing organic manure production, intermittent irrigation, and other useful innovations, and c) plant a clover crop instead of wheat between rice crops to enhance the soil’s fertility in rice-growing areas. A workshop was held at the Ministry of Agriculture on May 10, 2011, to review SRI progress over the past five years and plan for future activities. Khidhir Hameed and MRSS colleagues delivered several training courses with lectures in Najaf and Diwaniya Provinces from April 29 to June 7, 2009, that were attended by more than 1,000 rice farmers and agricultural staff. A field day was held on October 23, 2008, at the Al-Mishkhab Rice Research Station in Najaf, Iraq. During April and May, 2008, training on SRI methods was provided to 1,600 men and 400 women farmers in Al-Muthanna province. This was supplemented by 12 field demonstrations that were visited by over 1,200 farmers during the season. Training was also given to farmers on producing organic manure from farm materials. A field day was held on October 22, 2007, at the Al-Mishkhab Rice Research Station in Najaf, Iraq. In attendance were the Director of Rice Development Department; the General Director of State Board of Agricultural Research; the Head of Najaf Agricultural Committee; and the Director of Najaf Directorate of Agriculture. The State Board of Agricultural Extension and Cooperation and MRRS held a five day training course, 9-13 September 2007, at the Agriculture Extension and Training Center in Diwaniya province. Flayeh Abed Jaber, MRRS director, and Khidir made presentations to 28 agricultural staff from 8 provinces (Baghdad, Messan, Babel, Diwaniya, Muthanna, Thi Qar, Basrah, and Najaf). Hameed, Khidhir. 2007. Experimenting with the System of Rice Intensification in Iraq. ILEIA Magazine, Field Notes section, June. - The Iraq Agriculture magazine published by the Ministry of Agriculture to support its agricultural extension efforts, published an article on the concepts of SRI. Al-Hasanie, L. N. H., and A. D. Al-Maadhedi. 2017. Influence of irrigation periods and organic fertilizer on two rice varieties grown under System of Rice Intensifciation (SRI). The Iraqi Journal of Agricultural Sciences 48(3): 823-840. Hameed, Khidhir A., F. A. Jaber, and A. J. Mosa. 2013. Irrigation water use efficiency for rice production in southern Iraq under System of Rice Intensification management. Taiwan Water Conservancy Journal 61(4): 86-93. Hameed, K. A., F. A. Jaber, A. Y. Hadi, J. A. Elewi, and N. Uphoff. 2011. Application of System of Rice Intensification (SRI) methods on productivity of Jasmine rice variety in southern Iraq. Jordan Journal of Agricultural Sciences 7(3):474-481 (not online - for copies, write to K. A. Hameed). Hameed, Khidhir A., F. A. Jaber, A. Y. Hadi, J .A. H. Elewi, and N. Uphoff. 2009. Influence of System of Rice Intensification (SRI) Methods on Productivity and Yield Components of Jasmine Rice Variety in Al-Muthanna Province, Iraq -- Season 2008. Hameed, Khidir A., and Flaih A. Jaber. 2010 (March 22). The System of Rice Intensification (SRI) in Iraq. Arabic language video published on the SRI-Cornell channel on YouTube (in three parts). Salah Al-Deen, in Baghdad (18.0 MB). Hameed, Khidhir Abbas. 2018. Rice Water Management and Reduction in Iraq. 19 slides. Presentation at the SRI Research Side event at the 5th International Rice Congress, Sands Expo Convention Centre, Singapore. October 16, 2018. Hameed, Khidir Abas. 2014. Iraq's Strategy for Innovative Rice Irrigation and Water Management in Iraq. 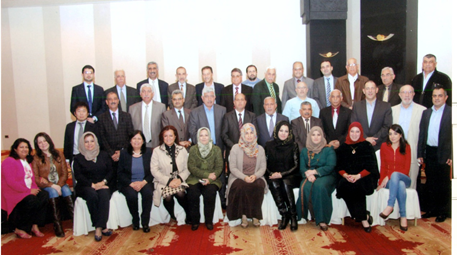 Presented at the Iraq’s Integrated Drought Risk Management Framework: The Validation Workshop, Amman, Jordan, March 2-5, 2014. 11 slides. Hameed, Khidir A. 2010. Photos of the Paddy Mechanization- Iraq. PowerPoint presentation (on slideshare.net) photos of paddy mechanization carried out at the Al-Mishkab Rice Research Station in Najaf, Iraq. 11 slides. Hameed, Khidir A. 2010. Photos of the System of Rice Intensification - Iraq. PowerPoint presentation (on slideshare.net) with photos about the development of SRI in Iraq, primarily in Al-Muthanna, Najaf and Diwaniya Provinces, between 2005 and 2010. 30 slides. CIIFAD SRI Iraq Photo Collection (see slide show in overview section above or click here to see individual photos).